Tired of going up and down the same old staircase? Kenny's Tile experts can go to work and give your old staircase the look that dreams are made of. 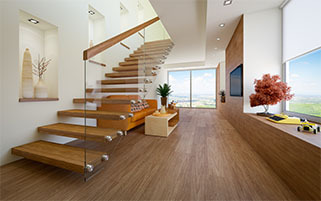 Pictures can only do so much, but the reality of a new staircase is just a call away. Call today and schedule a Free Estimate from one of our construction experts. They will be able to explain the whole process from beginning to end and answer any and all questions you may have. 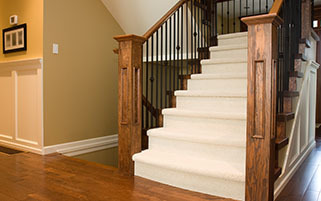 You can even pick your spindles and the finish on your beautiful hand crafted hardwood stair treads. The value of having a new staircase from Kenny's Tile is hands down the best home decision you will make; not just from an aesthetic value but from re-sale value as well. In many homes in the Kansas City area, the staircase is a focal point that people will see when they first enter. Kenny's can dress up that old staircase with many styling options. Our design team can come up with a look that fits your current decor and really adds drama to your staircase. 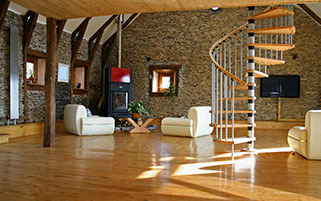 Kenny's can design your staircase with many different elements to match the unique look of your home. 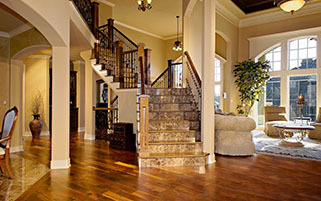 We can install hardwoods, carpet, or even tile on the staircase. Our showroom has a wide array of selections that can show you the different types of materials available for your staircase remodel. 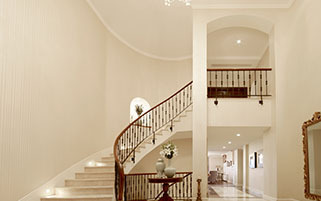 Our craftsmen can then handle your staircase project from start to finish. 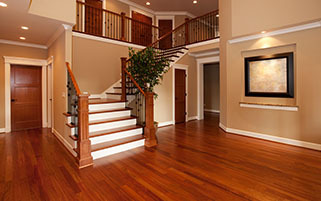 So the next time you are planning a remodeling project in your Kansas City home, don't forget your staircase. Kenny's can create a stunning entrance that sets the tone for your home. Call Kenny's today at 816-765-0400. Yes We Can. Yes We Will.